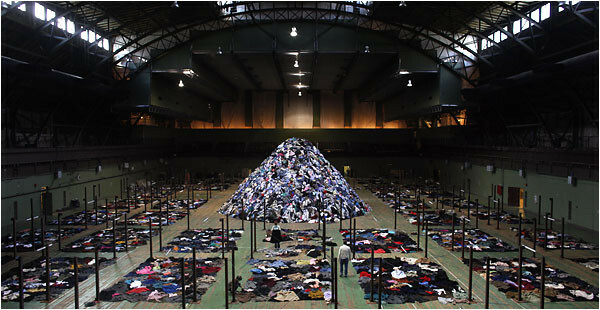 Christian Boltanski's artwork/installation, "No Man's Land": a huge crane and a 25-foot-high mound of salvaged clothing rising from the floor of the Park Avenue Armory’s big drill hall. Every few minutes the crane’s giant claw will pluck a random assortment of shirts, pants and dresses from the mound and then release them to flap back down randomly. Visitors can watch the action — set to a ceaseless, reverberating soundtrack of thousands of human heartbeats — from ground level, standing amid dozens of 15-by-23-foot plots of discarded jackets that extend in all directions from the mound and that may - should - evoke refugee or death camps. "No Man's Land" was described in the New York Times: here. Thank you for your close reading, Ms. O’Sullivan. I was wondering if you could describe the relationship between performing your work and writing it. Well, it depends on, every situation is different. Performing it is another opportunity to re-engage with the text at different levels, and another opportunity to negotiate the text on the page. As you’ve probably heard, I often find my work is quite difficult for me to read from the page. Writing it, I hear the sounds often in my ear. But having to perform it, all the difficulties emerge. There’s lots of disconnectiveness and disjunctiveness that is kind of working against how I sort of, how sometimes it seems it may be read. Would you consider, sort of, maybe, performing it to be more body intensive than, I guess, writing it. Well, writing is a body-intensive activity, totally. Absolutely, totally. The whole body is engaged in the act of writing. Whether it’s on the computer, with using a pen in the hands. The breath is involved in all activities. But with the performing, there are others that you have to connect with, and the place of performing also figures on it. A number of your poems integrate different languages, musical notes, pictures, and streaks, and they push the possibilities of poetic forms on the page. I was wondering whether this is supposed to conflict with the words, compliment them, or maybe even both.